Gru and the Minions are heading to your living room with “Despicable Me 3,” one of dozens of new films coming to TDS TV on Demand. In addition, we’ve got a pair of action flicks, including the rugged “American Assassin” and the outrageous “Kingsman: The Golden Circle.” If you are in the mood for an intense drama, the true-life “Detroit” should fit the bill. And finally, there’s “All Saints,” an entertaining faith-based film that is perfect for the entire family. Available December 5. Rated PG. Gru, is back – and this time he’s got a twin brother who wants to lure him back into a life of crime. 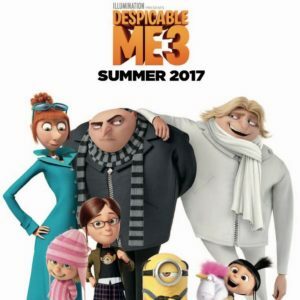 “Despicable Me 3” has got its formula down, including great animation, top-notch voice work (Steve Carell, Kristen Wiig, Trey Parker), a fun story and sharp dialogue. And while the film does not break any new ground, it provides lots laughs and smiles along the way for kids and adults. Available December 5. Rated R.
A young man (Dylan O’Brien) becomes a CIA black ops recruit after his girlfriend is killed by terrorists. “American Assassin” is a gritty, bloody affair that starts a bit slow, but really begins to click along the way. The story is pedestrian, yet effective. Michael Keaton has a lot of fun as the recruit’s no-nonsense mentor. Available December 12. Rated R.
“Detroit” portrays the events of June 25, 1967, when race riots engulfed the city. Directed by Academy Award-winner Kathryn Bigelow, “Detroit” focuses on one specific event where a dozen men and women were assaulted by local police and the Michigan National Guard. While the film drags in spots, it is a searing, powerful drama that will provoke outrage and shame and frustration in equal measures. If you saw the original “Kingsman,” you know what you are in store for here. The sequel is a cartoonish and crazy film, reveling in its violence and outrageous attitude. This time around, the Kingsman’s headquarters is destroyed, forcing them to team up with another secret organization based in Kentucky. “Kingsman: The Golden Circle” doesn’t reach the heights of its predecessor, but the stylized action, twisted humor and great special effects are worth the trip. The large and talented cast includes Colin Firth, Julianne Moore, Taron Egerton, Mark Strong, Halle Berry, Sir Elton John, Channing Tatum and Jeff Bridges. Available December 12. Rated PG. The pastor of struggling Tennessee church finds purpose and strength when he allows a group of Burmese refugees to turn his church’s land into a farm. Based on a true story, “All Saints” is one of the better faith-based films to come out in recent years – avoiding excessive proselytizing and just letting the inspirational story speak for itself. John Corbett stars.